The Elie Travel Hair Straightener is a salon quality mini straightener using ceramic technology with floating plates to deliver beautifully sleek hair every time. With its own patented swivel cable ensuring unrivalled manoeuvrability and ease of use, limitless styles can be achieved in minutes. And with the Intertek safety approval, heat resistant bag, and dual voltage (100v-240v) for worldwide use, these compact and lightweight hair straighteners are ideal for every lady on the go. With a powerful heating system the Elie Travel Hair Straighteners heat up to a maximum temperature of 195°C in seconds. The ceramic technology ensures the heat is maintained and distributed throughout the entire plate allowing hair to flow smoothly through the straightener, minimising heat damage and snagging, keeping your hair as protected and healthy as possible whilst creating silky smooth and shiny hair. 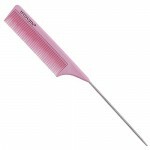 Curved corners also make the straightener perfect for creating carefree curls or styling shorter styles. Measuring only 18cm in length, the Elie Travel Hair Straightener is small enough for any purse or bag. The heat-proof protection pouch is also ideal for storage as it incorporates Velcro straps to safely pack away the 1.8m long reach lead. And with 5 bright colours to choose from, there is an Elie Travel Straightener for everyone. Elie Mini hair straightener is fitted with a U.K. 3 pin plug. High quality ceramic smooth glide and reduced frizz ensuring easy styling on the go. Unique design cool feel handle and patented 360 swivel cable. Fitted with a UK Plug, dual voltage (100v-240v) for worldwide use, with approved Intertek European electroninic safety certificate.